Dunkin' Donuts is the latest chain to launch a quirky food item: donut fries. What Dunkin (DNKN)' describes as five crispy pieces of donut dough dusted with cinnamon sugar and served in a box like french fries is yet another example of a restaurant trying to woo customers with a gimmicky culinary concoction. The trend arguably started in 2010 with KFC's infamous (and calorie-laden) Double Down sandwich -- bacon, cheese and sauce between two pieces of fried chicken instead of bread. Since then, we've seen Burger King's Whopperito (a burger in a tortilla) as well as Mac and Cheetos. Taco Bell, which like KFC is owned by Yum Brands (YUM), is responsible for Nacho Fries and Doritos Locos Tacos, which feature a corn shell seasoned with powdered orange cheese to look and taste like Doritos. Both Denny's (DENN) and Jack in the Box (JACK) have had different versions of bacon shakes. White Castle has chicken rings on the menu -- and Burger King has offered them in the past. The restaurants typically already offer unhealthy options like donuts or French fries. Launching Frankenfoods is a way to generate buzz with creations that often combine things people already like. The hope is those customers will come out to try donut fries or Doritos Locos Tacos. For many of these companies, the weird food items are working. Shares of Yum and Burger King owner Restaurant Brands (QSR) have surged over the past five years by 50% and 65%, respectively. That's better than the Dow and S&P 500. Related: Can Chipotle keep momentum with quesadillas and milkshakes? It's not surprising that other well-known chains are looking to spice things up. The healthier living trend isn't going away obviously. But there are only so many kale salads that people can eat. That's probably why other restaurants are adding more guilty pleasures to their menu. IHOP -- the franchise famous for its pancakes -- recently unveiled a new line of burgers and temporarily changed its name to IHOb. Struggling burger chain Sonic (SONC) unleashed a pickle juice snow cone slush. Dunkin' Donuts is just the latest chain to hop on board. In addition to the donut fries, which will only be available for a limited time, the company has a few other special summer offerings: a "shark bite" donut with shark-shaped sprinkles, a chocolate "coconutty" donut and a brown sugar, cold brew coffee. 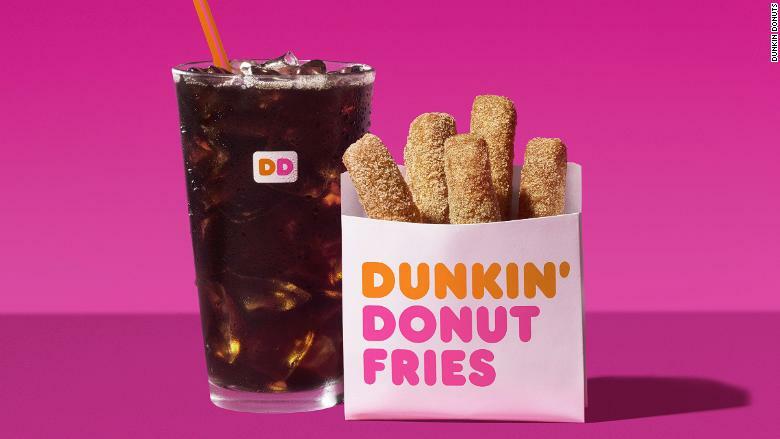 Tony Weisman, chief marketing officer for Dunkin' Donuts US, said in an email to CNNMoney that the company has high hopes for the donut fries, which tested well earlier this year in some markets in New England. Weisman conceded that "there have been some gimmicky items out there" but that Dunkin' thinks donut fries are an "innovation." That remains to be seen. But Dunkin' is doing well while coffee rival Starbucks faces some big problems lately. Shares of Dunkin' Brands are up more than 25% in the past year while Starbucks (SBUX) is down nearly 20%.